DIE Saturni, 22 die Februarii. Towns of Yarmouth and Leostoff, about a Fishery. Ld. Howard versus Liny, Bromhead, &c. for summoning him before the Justices for Sewers. Hampton, Ld. Sandys' Servant, Arrest. Fleshmonger and Clarges to attend. Cler. Parl. to issue Warrants for Witnesses. Harding versus Pight, in Error. Hodie 1a vice lecta est Billa, "An Act to enable William Lord Widdrington to sell some Lands, for Payment of the Portions of his Younger Brothers and Sisters, and for providing for Younger Children." 1. "An Act to enable Mrs. Clemence Ryvers and Mrs. Rose Ryvers to sell certain Lands and Houses, for Payment of Debts of Edward Ryvers Esquire, deceased, and Provision for his Younger Children." 2. "An Act for enabling of Thomas Knollys Esquire to sell the Manor of Bowcomb, for Payment of the Debts of Sir Henry Knollys deceased, his Elder Brother, and for the raising of Portions for his Younger Children." The Earl of Bridgwater reported, "That the Committee have considered of the Marquis of Winton's Bill; and, having heard all Parties, and received their Consents therein, the Lords think it fit to pass, without any Alteration." Hereupon it is ORDERED, That the said Bill be engrossed. 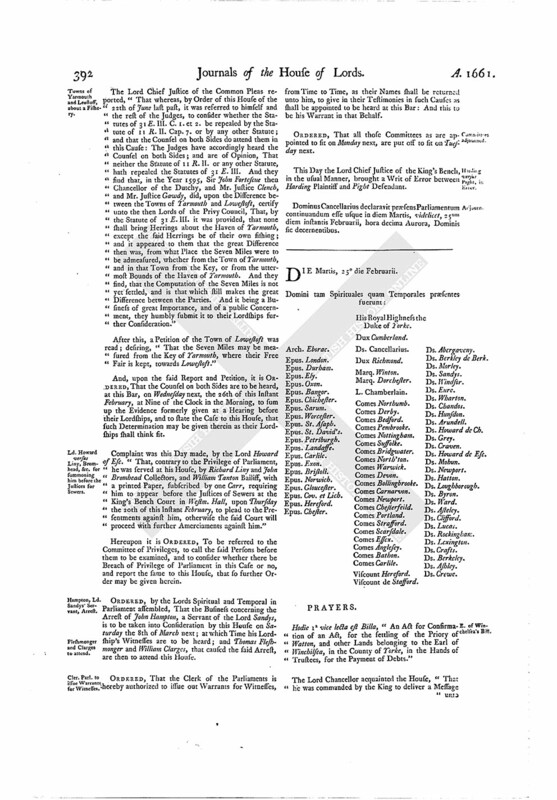 "The Lady Katherine Vanlor Plaintiff, and Edward Bushell Defendant, in the Writ of Error, upon a Judgement given in the King's Bench, where Bushell was Plaintiff against Vanlor, in an Action of Ejectment, for Two Water Mills, in the Town of Hertford, whereunto Not Guilty was pleaded, and a special Verdict found; and upon Argument Judgement was given for Bushell, the Plaintiff in the Action. Bushell declared, That John Harrison, the 20th of November, 1655, did demise unto him the Premises, to hold, from the Tenth of November then last past, for Five Years. "The Plaintiff, after the Judgement, sued forth an Habere sacias Possessionem, wherein is set forth, That Harrison, the 20th of November, 1657, did demise unto him the Premises, to hold, from the Tenth of November then last past, for Five Years; and the Sheriff is commanded to deliver to Bushell his Possession of the said Term. "The Writ of Execution is not warranted by the Judgement; for, by the Writ, the Term is enlarged Two Years beyond the Term mentioned in the Declaration; and that Matter is particularly assigned for Error. Besides this, the Writ of Execution is inconsistent in itself; for it beareth Date the 17th of June, 1657, and is returned executed the Second of July following, upon a Demise alledged in the Writ to be made in November 1657, which is subsequent to the Time both of the issuing forth and executing of the Writ. "This being the State of the Case, his Lordship and the rest of the Judges to whom it was referred are of Opinion, That the said Execution of the Judgement is neither in the Matter or Manner of it good or valid in Law." Hereupon the Lords Spiritual and Temporal in Parliament assembled do hereby Adjudge, Order, and Declare, the said Judgement to be affirmed; but the said Execution thereof to be erroneous: And therefore is hereby reversed and nulled; any former Proceedings to the contrary notwithstanding. The Lord Chief Justice of the Common Pleas reported, "That whereas, by Order of this House of the 22th of June last past, it was referred to himself and the rest of the Judges, to consider whether the Statutes of 31 E. III. C. 1. et. 2. be repealed by the Statute of 11 R. II. Cap. 7. or by any other Statute; and that the Counsel on both Sides do attend them in this Cause: The Judges have accordingly heard the Counsel on both Sides; and are of Opinion, That neither the Statute of 11 R. II. or any other Statute, hath repealed the Statutes of 31 E. III. And they find that, in the Year 1595, Sir John Fortescue then Chancellor of the Dutchy, and Mr. Justice Clench, and Mr. Justice Gawdy, did, upon the Difference between the Towns of Yarmouth and Lowestost, certify unto the then Lords of the Privy Council, That, by the Statute of 31 E. III. it was provided, that none shall bring Herrings about the Haven of Yarmouth, except the said Herrings be of their own fishing; and it appeared to them that the great Difference then was, from what Place the Seven Miles were to be admeasured, whether from the Town of Yarmouth, and in that Town from the Key, or from the uttermost Bounds of the Haven of Yarmouth. And they find, that the Computation of the Seven Miles is not yet settled, and is that which still makes the great Difference between the Parties. And it being a Business of great Importance, and of a public Concernment, they humbly submit it to their Lordships further Consideration." After this, a Petition of the Town of Lowestost was read; desiring, "That the Seven Miles may be measured from the Key of Yarmouth, where their Free Fair is kept, towards Lowestoft." And, upon the said Report and Petition, it is ORDERED, That the Counsel on both Sides are to be heard, at this Bar, on Wednesday next, the 26th of this Instant February, at Nine of the Clock in the Morning, to sum up the Evidence formerly given at a Hearing before their Lordships, and to state the Case to this House, that such Determination may be given therein as their Lordships shall think fit. Complaint was this Day made, by the Lord Howard of Esc. "That, contrary to the Privilege of Parliament, he was served at his House, by Richard Liny and John Bromhead Collectors, and William Tanton Bailiff, with a printed Paper, subscribed by one Carr, requiring him to appear before the Justices of Sewers at the King's Bench Court in Westm. Hall, upon Thursday the 20th of this Instant February, to plead to the Presentments against him, otherwise the said Court will proceed with further Amerciaments against him." Hereupon it is ORDERED, To be referred to the Committee of Privileges, to call the said Persons before them to be examined, and to consider whether there be Breach of Privilege of Parliament in this Case or no, and report the same to this House, that so further Order may be given herein. 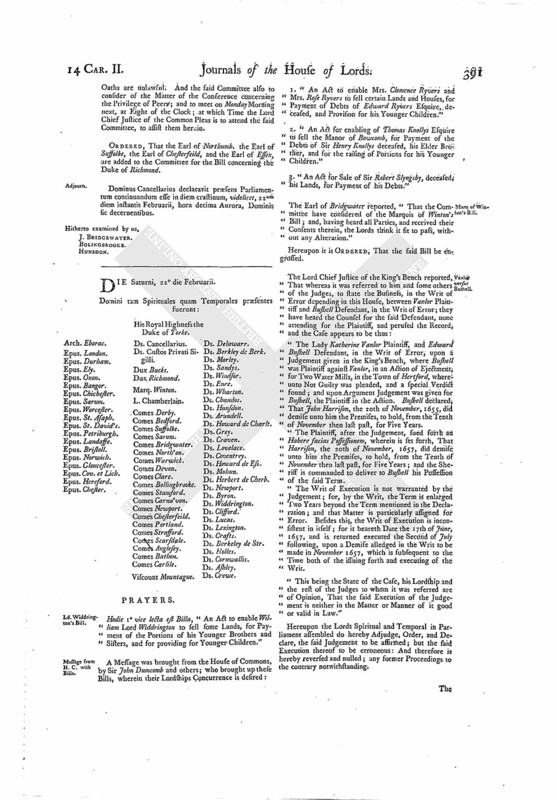 ORDERED, by the Lords Spiritual and Temporal in Parliament assembled, That the Business concerning the Arrest of John Hampton, a Servant of the Lord Sandys, is to be taken into Consideration by this House on Saturday the 8th of March next; at which Time his Lordship's Witnesses are to be heard; and Thomas Fleshmonger and William Clarges, that caused the said Arrest, are then to attend this House. ORDERED, That the Clerk of the Parliament is hereby authorized to issue out Warrants for Witnesses, from Time to Time, as their Names shall be returned unto him, to give in their Testimonies in such Causes as shall be appointed to be heard at this Bar: And this to be his Warrant in that Behalf. ORDERED, That all those Committees as are appointed to sit on Monday next, are put off to sit on Tuesday next. This Day the Lord Chief Justice of the King's Bench, in the usual Manner, brought a Writ of Error between Harding Plaintiff and Pight Defendant. Dominus Cancellarius declaravit præsens Parliamentum continuandum esse usque in diem Martis, videlicet, 25um diem instantis Februarii, hora decima Aurora, Dominis sic decernentibus.